Now I would like to discuss with you how to set up a ferret cage. 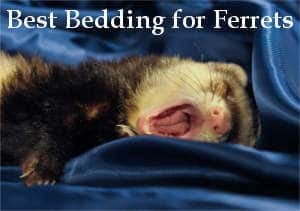 As all small pets, including Goof, adore sleeping in dark, soft places, climbing on the higher ground, and sleep about 20 hours a day (adult animals) they need the best bedding for ferrets. Thus, wood shavings or cellulose bedding would be not ok in this case. Additionally, it commonly makes the ferret stink. I think the best place for my pet to sleep is a hammock. It makes the essential safety and darkness, adding some warms and avoiding immoderate pressure on the animal’s body. So, I’m offering you two ferret bedding sets that are soft, top-quality and comfortable. The set consists of 2 products: a nap sack and a hanging monkey hammock and that is a real fun! If you have kids, they would like the hammock a lot as it looks like a toy. As to the ferrets, they adore this interactive item, as it’s soft and comfortable, so I recommend it as the best bedding for ferrets. It comes with adjustable straps, warm, top-quality and comfortable. The hammock is roomy enough, it’s volume is 5 quarts. However, if you have 2 or more pets, I would better recommend you the nap sack that is a bit larger, measuring 13*16 inches. The hammock is made of fleece that may be called the best ferret bedding material, as it’s really soft and comfortable, but still, machine washable that is important to keep the pets and the cage clean and odor-free. It is also great if you live in the mountains or during the cold winters. But as our climate is continental, my boy still prefers the nap sack. The ferret bedding can be used both inside and outside the cage, but if you have the other pets like cats or dogs, try to watch their reaction to the outside use during the first hours, or just avoid it. Please, also check the strap length adjusters carefully to avoid your pets falling down. The straps are still durable, and the issues are not common. So I recommend these products to all ferret owners, as the bedding is comfortable, warm and just cute. As is it to be washed quite often, I would advise you to purchase both ones or just two nap sack items. The second product I recommend is really durable and well-constructed. But the bedding is still quite soft and comfortable. I think that it’s even better than the previous one in terms of reliability, but not so perfect by design. As for me, I don’t like the colors as only brown, gray and purple are available. The hammock is dual-level, quite roomy and cozy for Goof. It makes 16*12 inches by dimensions. Being made of plush and quilted cotton, the principal part is top-quality and pleasant to touch. A bedding material perfectly copes with machine washable that is essential for the ferrets’ hygiene. The nylon straps with metal clips are really durable. The hammock is recommended for 2 adult ferrets, as they can snuggle on the top or get inside for the night sleep or for additional privacy. I have tried it for Goof, and he liked it, feeling comfortable inside. Meanwhile, I’ve found the information that the ferrets still may loosen the strips, so, it requires your close attention to avoid any risk. As to the ferret bedding material, I guess, it’s the best possible, durable and soft simultaneously. So, I still recommend the product to you as its quality is really superb, and the hooks are reliable. Meanwhile, if you select this item, check the hammock for damages regularly and replace it as soon as it starts wearing out. the straps are not adjustable, so you can’t regulate the hammock hanging height. Do ferrets need bedding? Quite naturally, they do. Thus, hammocks and nap sacks are still the best accessories. These products are warm, soft and comfortable. Meanwhile, select the ones that are made of the durable materials that are machine washable. The fabric can be easily chewed or crabbed anytime, so, I would recommend checking it regularly and replacing on time. The hammock is to be washed about once a week or when the odor appears. As to the clips, they may be absent within the package. 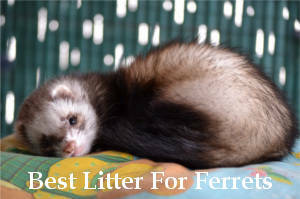 If they are still available, fasten them in a reliable way to avoid your ferret falling down. 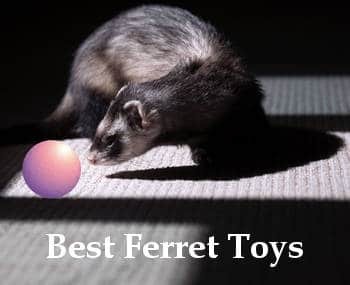 So, I have shared the best ferret bedding ideas with you. If you still want to ask me a question or tell about your experience, please, drop me a line. Rafael, I just wanted to say that I appreciate these posts a ton. It’s hard to find useful information online for ferret owners but I think you have done a great job in putting together all the essentials in one website. Thank you. I think you did an amazing job showcasing the best ferret hammocks. Although, to anyone who purchases one of these items… I’ve found that over time they eventually start to rip and tear. So, make sure to check your hammock once in a while to make sure it’s still in good condition. I really like the second hammock you listed. I think it’s important that my ferret has a place that it can nest in, which makes this two layered hammock perfect for him. Thanks for the recommendation! Interesting idea, if you don’t mind me asking… why do you prefer hammocks for ferrets? It seems that they would be just fine in a normal cage or do they naturally sleep in trees which makes a hammock a close comparison?